Right now, we are getting into murky domain of absolute Enya completists. If you got here, it means that you’ve already heard all of Enya’s solo material and are willing to listen to anything that she’s ever put her finger on. Why not, I say. In the early 80s, Mairéad Ní Mhaonaigh and Frankie Kennedy (now known as Altan) formed a band with Gearóid Ó Maonaigh and Enya. 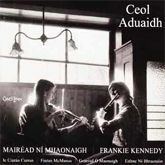 The group was short-lived but the members contributed to Mairéad and Frankie’s debut album ‘Ceol Aduaidh’ produced by Nicky Ryan. Enya is featured on ‘An Clár bog Déil’, a traditional Irish song. She plays the synthesizer while Mairéad sings the lead vocal. 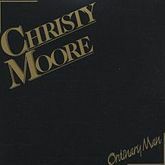 ‘Ordinary Man’ was recorded at the old Aigle Studios and engineered by Nicky Ryan. Enya provided backing vocals on ‘Sweet Music Roll On’, ‘The Diamondtina Drover’, and ‘Quiet Desperation’. She is also credited as an assistant arranger for the album. Enya recorded a spoken passage from The Bible for the track ‘Never Get Old’. This is my favourite guest contribution by her because we get to hear her speaking Gaelic. Enya and Sinéad were not in the studio together, Enya recorded her part separately and then sent it over. Enya provided multi-tracked backing vocals for the track ‘The Whole of the Moon’. 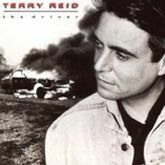 This uncredited contribution was recorded at London’s Sarm West studios during the mixing of ‘Shepherd Moons’. So should you get these? It might be worthwhile to give some of the songs a listen for the curiosity sake but do not expect anything spectacular. I own just ‘The Lion and the Cobra’, and do not plan to buy the rest. Tidbit of trivia: Mike Oldfield asked Enya to provide harmonies for his single ‘Pictures in the Dark’ while she was still in Clannad. The collaboration unfortunately didn’t happen. Eternal pity, Mikey boy. i love her music and my dad did well done for making very nice music enya wish i could meet u if u played live maybe 1 day. makes u think about life and urself. i’ll lookforward to hearing the new album makes u think of grief too tho and sadness. Hi Victor, this isn’t Enya but it sounds like someone put a lot of effort into covering the song! The main vocal track sounds like a very ‘tight’ choir match. Such a great way to enhance female vocals, I’d force my daughter into that! But all the rest sound like tracks from the original LP recording. I wonder who has access to that stuff! “Book of Days” remains a fabulous score and I think this vocal attempt isn’t bad at all. I guess I am the ‘completist’ described above. 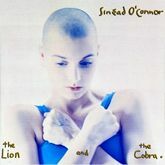 I thought maybe Enya played more on Sinead’s album. I wonder which early Clannad songs feature her?